The end of the month and time to say Goodbye to August 2017 under a nice and fairly sunny last day of the month. It's currently 30.7C at 10.50am and partially cloudy to sunny. How an August day on Koh Samui should be but how it wasn't all month long. Last night we had some rain and during half of the days this month we had rain. Most of the time just some tropical showers, meaning short and possibly hard rain but we also had a couple of storms moving over our island this month. Max temperatures ranged between 30C and 34C throughout the month, which is fairly steady and expected but in general it was not a great August with a bit more rain than average, in my opinion. Goodbye to August 2017; Car accident near the Bophud school yesterday. The driver must have gone very fast in order to park his or her car illegally upside down! Be careful out on the Koh Samui roads, it's dangerous out there! Looking forward to next month! Plenty of races to be run on Samui, 2nd September the Cancer Care run in Nathon at the Seatran pier. 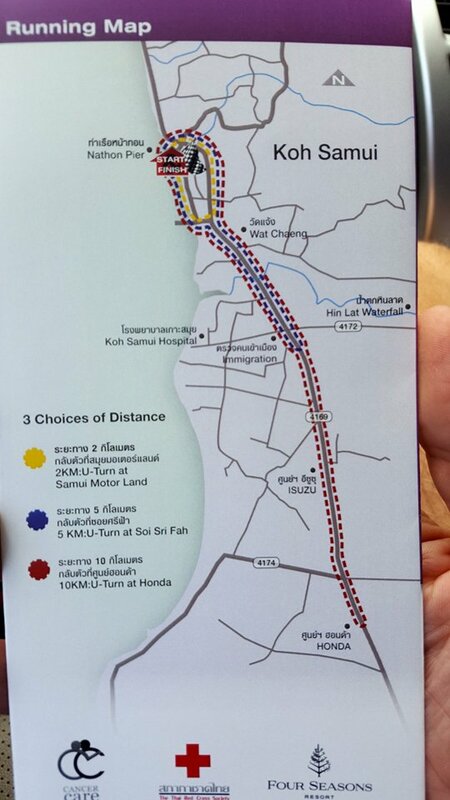 9th September the Samui Festival marathon at the Wharf (I will only run the 10km distance). The 23rd will see the North - South charity run which is followed by the Mad Hatter run come 24th, also at the Wharf. See you there? It's Sunday, just past noon and time for the Koh Samui, Thailand weekly weather update; 21st August – 27th August, 2017. It was mostly cloudy over Koh Samui this morning but right now, around noon we have a lot more blue in the sky with a current temp of 28.8C and starting to heat up. 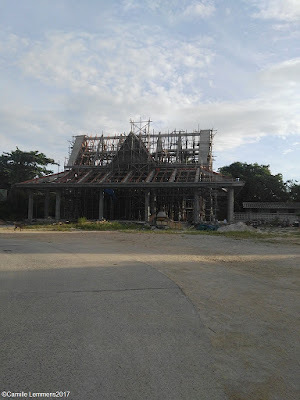 Koh Samui, Thailand weekly weather update; 21st August – 27th August, 2017 ; In Wat Plai Laem they're building a new kitchen area where local people can cook food during private ceremonies. The temple has all the pots, pans and cutlery available. Last week it was hot and humid and four out of seven days saw some tropical rain showers. Max temperatures ranged between 32C and 34C. Fairly steady and typical for an average August on Koh Samui. We may see some strong wind tonight and tomorrow but the rest of the coming week should be fairly nice and sunny! A nice and sunny end of this August month and a nice and warm start of Septembe seems to be in the cards! 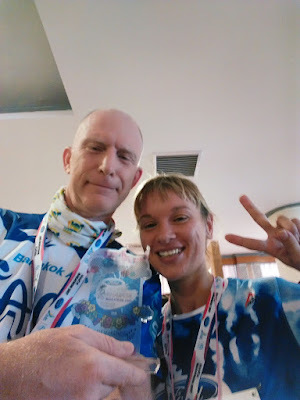 Koh Samui, Thailand weekly weather update; 21st August – 27th August, 2017; After the Khanom half marathon, which I won in my age group 50-59 in 1:45'27 or a 5'05 pace together with Elena, another Samui resident. She won the full marathon distance all over for females in a stunning 3:31. An amazing achievement Elena! Congratulations. Oh, and the trophy she won barely fitted in her car! Sunday morning and time for the Koh Samui, Thailand weekly weather update; 14th August – 20th August, 2017. Today is my last day on Phuket, the August PADI IDC on Phuket has been completed and my candidates are on the second and last day of their PADI IE, their Instructor exams. Tomorrow I will be on my way home to Koh Samui again. It's partially cloudy here with a current temp of 30.6C at 9am. 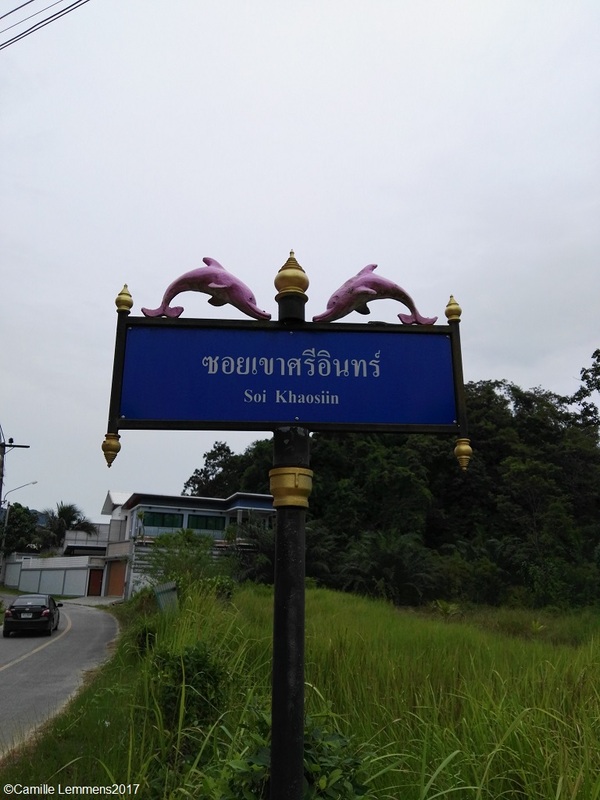 Koh Samui, Thailand weekly weather update; 14th August – 20th August, 2017; The pier and the small harbor for local fisherman's boats, some private small sail yachts and plenty of tour trip boats at Plai Laem beach. A real marina! Last week we had some rain between Tuesday and Thursday with all days of the week being partially cloudy. It was nice and warm though, all week long with temperatures ranging between 31C and 33C. Maybe not as good as your average August week on Koh Samui should be but still a very enjoyable week. Next week looks good around Koh Samui with mostly partially cloudy skies, a nice breeze and occasionally a tropical shower. It should be an enjoyable week with nice weather, enjoy! Sunday morning and time for the Koh Samui, Thailand weekly weather update; 7th August – 13th August, 2017. Since a week I find myself back on Phuket, for the August 2017 PADI IDC program. It's fairly cloudy here with a few blue spots in the sky but also a good chance of rain later today. Current temp at 8am is a cool and fresh 25C. A typical monsoon day on Phuket! Koh Samui, Thailand weekly weather update; 7th August – 13th August, 2017; The Big Buddha area. The road has now been paved, or rather cemented and the puddles are now a thing of the past at the Big Buddha area. Last week saw a wet start of the week around Koh Samui with a few showers but than it remained dry for the second part of the week and it was very hot and humid around the island. Maximum temperatures last week were really steady between 32C and 33C. The forecast for next week doesn't look too great, especially not for an August on Koh Samui. Mid week there may be some some hard wind and each day may see a tropical shower. It will keep things cool but hopefully there will be some sunshine as well each day. 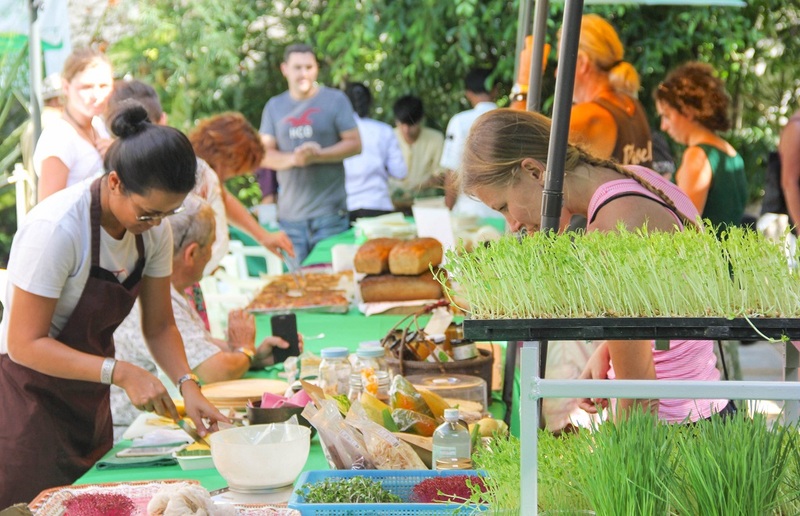 The Next Samui Green Market is on Sunday 13th August at Elysia, Fisherman's Village and it's once more a great opportunity to find cool products, great ideas and positive people. 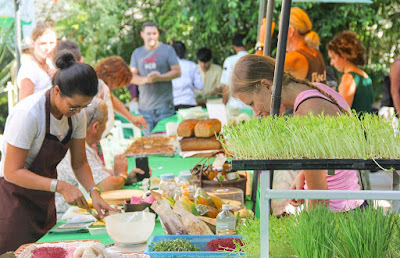 The Samui Green Market will be open from 3pm until around 7pm. There'll be a silent auction this time around and a 'second chance' sale; Bring your quality second hand clothes to contribute to our fundraising drive. As always during the Samui Green markets, please don’t forget; no plastic, no foam. Please bring your own shopping bags. For me it's always enjoyable to visit and be able to buy some real nice bread and enjoy the various healthy food options on offer with lots of organic options. There will be live music and the Elysia Boutique Resort offers some good snack and food options to enjoy the afternoon. Although I will be on the mainland this coming weekend, wishing I was able to visit, I can highly recommend having a look at the Next Samui Green Market is on Sunday 13th August at Elysia, Fisherman's Village. It's Sunday, we're around 10am and it's time for the Koh Samui, Thailand weekly weather update; 31st July – 06th August, 2017. We went shopping for her shop at Big Buddha and I ran the Bangkok Airways Phuket half marathon with a 5am start. A race in the same series as the Bangkok Airways Koh Samui marathon. Six weeks ago I also ran the half marathon. I ran a little bit faster compared to the Koh Samui marathon but competition is much stiffer here and with a 1:51'03 time, I came in 53rd of 711 participants and 8th in my age category of 50-59 with 55 participants. Alas, there were only 5 trophies. This afternoon it's back to Koh Samui and tomorrow I will drive back to Phuket again to start the August 2017 PADI IDC on Phuket. Last week saw mostly partially clouded skies overt Koh Samui with a very rare tropical shower thrown in for good measure. Maximum temperatures ranged from 32C to 34C and a lot of times it felt a lot warmer. The forecast for next week is looking good. Cloudy to partially cloudy skies with a rare tropical shower, most likely today or tonight. Towards the end of the week and next weekend the sun might be out and shows off it's presence a bit more. Enjoy this first August week of August 2017! 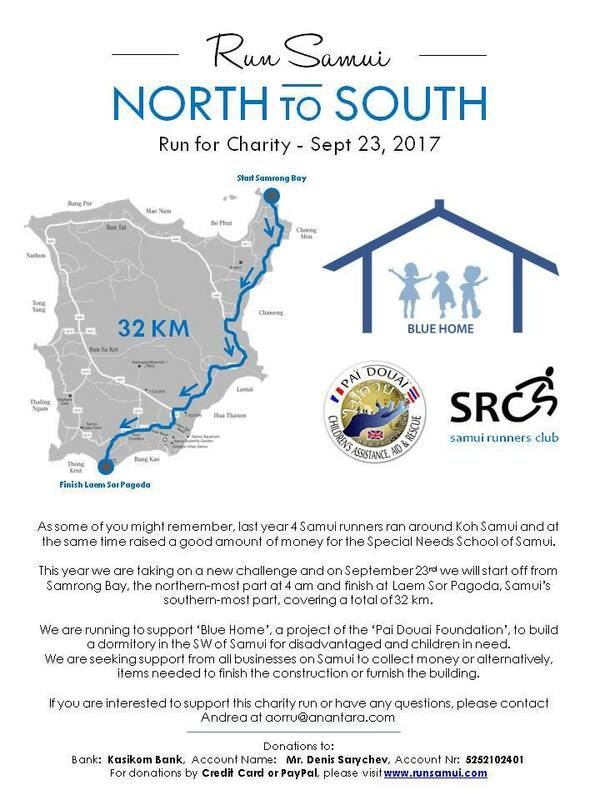 Next month will see the Run Samui, North to South run, 23rd September, 2017, during which a maximum number of ten runners will run from Koh Samui's most Northern poit, Samrong Bay at 4am to Koh Samui's most Southern point at Laem Sor Pagoda. The total distance will be 32km and it will be run as a group at a 6'00 minute per kilometer pace. This is not a race but an all start together, all finish together event. 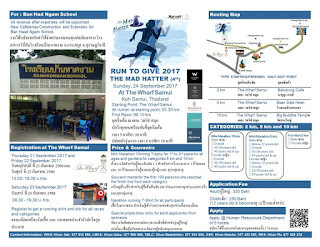 The event is held in conjunction with the Samui Runners Club. Last year this event involved a run around the island and each year we're looking for a different distance and route. This year the chosen charity is the 'Blue Home', a project of the 'Pai Douai Foundation'. A dormitory is being build in the South Western part of the island for disadvantaged children and children in need. Last year 140,000.-THB was raised to help build the school for children with special needs. This year we hope to equal that and get the same amount of money through donations. Run Samui, North to South run, 23rd September, 2017; From left to right; Michael, Camille, Tony and Andrea. Four runners that will be participating in this charity run. If you're interested to donate or participate, let us know, please don't hesitate to get in touch and contact me. The 10th Cancer care run, 2nd September 2017 is coming up this Saturday 2nd September. 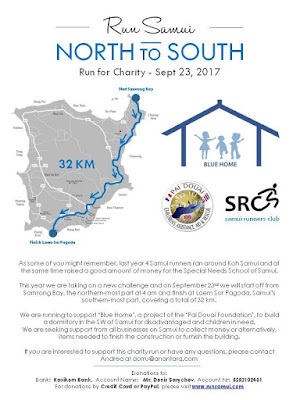 Start and finish will be at the Nathon pier area, in front of the post office and near the Seatran pier. As always, this charity event will be organized by the Four Seasons Resort on Koh Samui. The distances on offer are a 2km fun run, a 5km and 10km race, with prices for the first three finishers in each age category and tombola prices for all who have tickets. Start of the races will be around 6am. Since 2011 I was able to participate in six consecutive events and it looks like I can add event number seven this year! I'm looking forward to that! 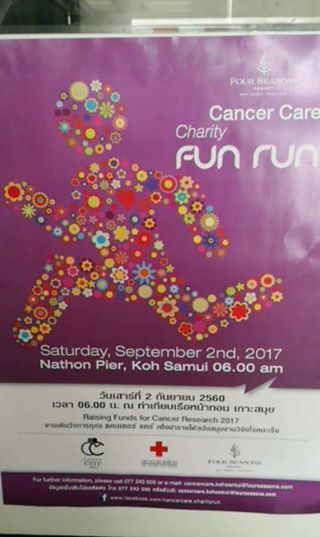 10th Cancer care run, 2nd September 2017; the flyer for this years event has a picture of me at the start from one of their earlier races. It is a charity event and all proceed will go towards improvement of cancer treatment. The race is inspired by Terry Fox's Marathon of hope in 1980. With one leg amputated he planned on running from east - west cross Canada to raise money and awareness for cancer research. Although the spread of his cancer eventually forced him to end his quest after 143 days and 5,373 kilometers (3,339 mi), and ultimately cost him his life, his efforts resulted in a lasting, worldwide legacy. The annual Terry Fox Run, first held in 1981, has grown to involve millions of participants in over 60 countries and is now the world's largest one-day fundraiser for cancer research; over C$650 million has been raised in his name. 10th Cancer care run, 2nd September 2017; This years route. This is where the Four Seasons come in. The hotel chain originated in Canada and during Terry's marathon of hope, he was often invited to stay over in Four Seasons resorts. Fox arrived in Montreal on June 22, one-third of the way through his 8,000-kilometre (5,000 mi) journey, having collected over $200,000 in donations. Around this time, Terry Fox's run caught the attention of Isadore Sharp who was the founder and CEO of Four Seasons Hotels and Resorts – and who had lost a son to melanoma in 1978 just a year after Terry's diagnosis. Sharp was intrigued by the story of a one-legged kid "trying to do the impossible" and run across the country; so he offered food and accommodation at his hotels en route. When Terry was discouraged because so few people were making donations, Sharp pledged $2 a mile [to the run] and persuaded close to 1,000 other corporations to do the same. Sharp's encouragement persuaded Terry to continue with the Marathon of Hope. Hope to see you come Saturday 2nd September, at 6am at the Nathon pier starting point. The 4th Mad hatter run Sunday 24th September at 'The Wharf' is coming up next month. There are three different distances on offer; 2,5 and 10km, each distance with start and finish at 'The Wharf'. 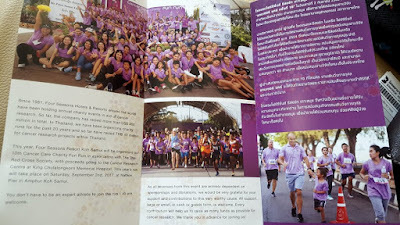 This is a race event organised by the Marriott Hotels, on Koh Samui being the Vana Bell, A Luxury Collection, the Sheraton Samui Resort, the W Koh Samui, Le Meridien Koh Samui Resort & Spa and the Renaissance Koh Samui Resort & Spa. It's held at the same day all over Thailand, where there are Marriott hotels. The first two years I was able to participate on Koh Samui's event but last year the event was postponed due to the passing away of King Bhumibol, and it was rescheduled in November. Last year I managed to participate in the Phuket event. This year I may not be able to participate at all, since I may be on Koh Phangan. Nonetheless, this shouldn't stop any of you in participating! All runner at starting point: 05.30 hrs. Hope you will make it out to the Wharf come Sunday 24th September and enjoy a nice early morning run! 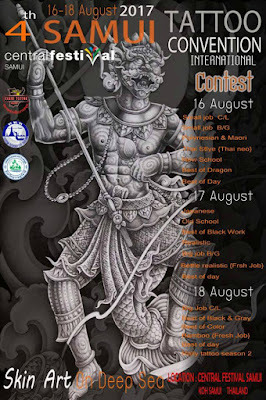 It's already the 4th Samui tattoo convention at Central Festival, 16-18 August coming up! Last years event was held in April, now we're already in August. It will be a good time to get some ink done. Besides many local tattoo artists, there will also be artists coming from all over Thailand, including Pattaya, Hau Hin, Phuket and Bangkok. There will be also international guests; Danis Nguyen from Vietnam and Ly Ling from Malaysia. Many different styles and forms of tattooing will be available, from machine to bamboo. Do your homework and get the artwork you like and want. Many of the artists will also be happy to make appointments with you after this event, if you like or prefer somebody's specific style. If you're just slightly or deeply interested in the art form of tattoo, this is your chance to connect with some real good artists and see them at work. 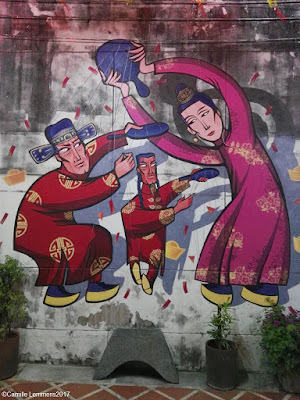 Go out and visit Central Festival on either the 16th, 17th or 18th August and enjoy the show and work on display. The beginning of a new month and hence it's a well meant Welcome to August 2017. Typically a very nice month around Koh Samui with plenty of sunshine and just an occasional, although sometimes intense, tropical shower. A good and busy month on the Samui archipelago, also known as high season. Plenty of visitors or Europe during their summer holidays join us on Samui shores, to enjoy the sun, good food and warm weather and everything else that Koh Samui has to offer. Last year saw a not so great August though, with the first three weeks of August 2016 being rather wet and windy. Hopefully this year will be off to a better start and today is proofing just that. It's sunny and we have blue skies all during the morning. It's noon now, almost 1pm and the current temp is 32C. Welcome to August 2017; Have you seen this before. The sure sign that you're about to enter a Temple party event. This one was earlier this year at Wat Na Phra Lan in Maenam, a temple that once used to play an important role on the island. Nowadays it's slowly has become less important over time. The Lomprayah pier is located at or rather next to the temple premises, but you have to enter and leave partly over temple grounds. The Lomprayah boats offer various daily trips to Koh Phangan and Koh Tao. This month will have the 4th Samui Tattoo convention at Central Festival Samui, something I am still planning to blog about. The tattoo convention is supposed to be held 16-18 August. Enjoy your time on the island and I hope to hear from you with any remarks or questions.